It is without a doubt the highest selling album of the year and is still selling over 100,000 copies a week in the United States, 9 months after it's release, all of this in the same country that has made Ke$ha a superstar. 21 is quite the fitting name for the album, as it has went #1 in 21 countries. The pride of England has definitely made her country proud, but the real question is, has she made me proud? The album starts out strong with the mega-hit "Rolling in the Deep" and the beautiful "Rumour Has It" which has a familiar feel to the opener. Then we change the pace on the next couple of tracks that could make any breakup victim cry tears of memories. No worries though, Adele gets our feet tapping and our head nodding with the *Prediction* next mega-hit on the album "Set Fire to the Rain". 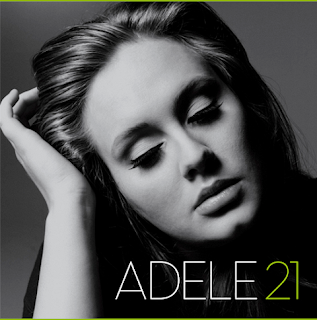 "Set Fire" is an up-tempo ballad that portrays Adele's naivety in a relationship as she thought she was some guys special someone. Guess what? She wasn't. I'm sensing a theme here. The next song "He Won't Go" has more of an R&B feel to it than any other track on the album, which makes it stick out like a sore thumb. Six songs into the album and we have found the first flaw, not a bad ratio. Track 7 "Take It All" is vintage Adele, it doesn't have quite the emotion or hook that some of her ballads have on it but it is a solid space filler that is sure to strike a chord in some poor soul with a broken heart. A gospel sounding choir makes a small appearance on the track and might have made the track great only if only they had a bigger more resounding part in the song, moving on. One of my favorite songs on the album is "I'll Be Waiting" it has one of the best hooks and incorporates a great flow with the backup singers, jazz band, and Adele coming together to make this upbeat track shine. The final 3 tracks of the album consist of brilliant emotion in the down-tempo jazzy ballad "One and Only", a sweet remake of The Cure's Lovesong, and finally the #1 song in America. You know that old saying "save the best for last"? There is no better example of that then "Someone Like You". It is so rare to hear a song portray so much raw emotion while connecting such impeccable lyrics to a melody that would give anyone cold chills. America rarely gets it's #1's right, but this gives me hope that true artistry can be appreciated in todays world which consists of an abundance of auto-tune. "Someone Like You" is a perfect ending to an almost perfect album. Adele is at her best in 21 and I for one cannot wait for her next effort. 23 anyone? I'm a snarky, sarcastic college student with opinions, that is just the worst.